Melissa Courtney and Jeremiah Azu made it a medal-winning first day for Wales at the British Athletics Championship in Birmingham. Seventeen-year-old Azu earned bronze in the 60m, while Courtney went one better in the 3,000m as a number of Welsh athletes also qualified for finals and claimed personal best performances. Poole AC athlete Courtney finished second to double European indoor champion Laura Muir in a time of 8:50.61, automatically claiming a spot at next month’s European Indoor Championships in Glasgow. Courtney, who set a new Welsh record and new world lead over the distance last week, said: “I’m really happy with that and I have my spot for Europeans which is a massive thing for me. “I already had the time from last week so I’m happy with that. You always want to do a bit more but I’m happy with it, I gave it a good go and I’m happy with where my speed is at. “I won’t be racing again until Glasgow, now it’s about sharpening up before then and being in the best shape I can. Melissa Courtney qualified for European Indoors in Glasgow in March. 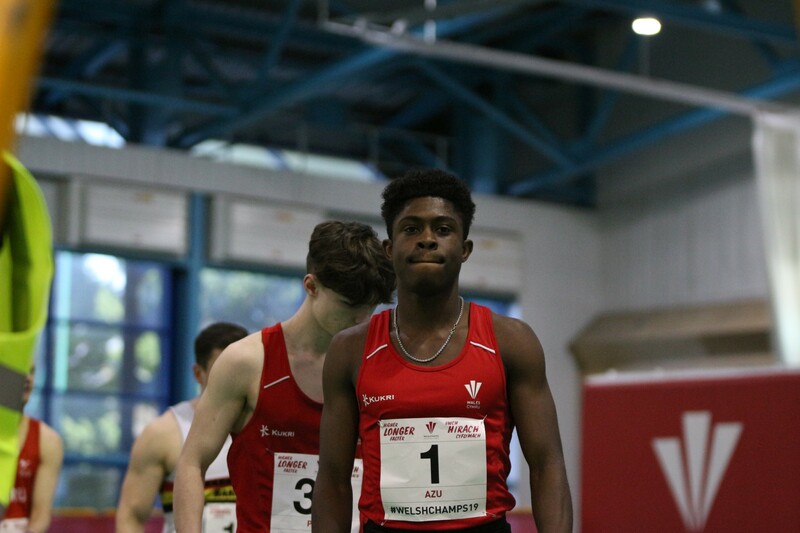 In the 60m Azu brilliantly put aside the disappointment of being disqualified in last month’s Welsh Indoor Championships by running PBs in every round in Birmingham. The Cardiff AAC man won his first heat in a new best of 6.73 seconds ahead of Kyle De Escofet and former world and European indoor champion Richard Kilty. De Escofet gained revenge in the semi, but Azu went through to the final in second place by lowering his best to 6.72. The final saw Azu run even faster, slashing his PB to 6.66 as he was agonisingly pipped to the silver medal by Adam Thomas, who clocked the same time but was given the nod. Dominic Ashwell claimed gold in 6.64. The teenager’s time puts him top of the Welsh all-time under-20 rankings ahead of Christian Malcolm. A delighted Azu said: “I’m so happy. My expectation was just to make the final and anything over that is a huge bonus to me. That’s a major blessing. Also in the 60m, fellow Cardiff athlete Sam Gordon ran a season’s best of 6.78 to finish third in his heat and then lowered it to 6.77 finishing fifth in his semi-final. Swansea Harrier Hannah Brier reached the final of the women’s 60m after winning her heat in 7.52 and finishing fourth in her semi-final in a time of 7.47, which she repeated to finish seventh in the final won by Asha Philip in 7.19. In the men’s 400m, Cardiff AAC’s Owen Smith ran a season’s best of 47.09 to win his first round heat, while Swansea Harrier Joe Brier set a PB of 47.46 to finish second in his first round race. The training partners were paired together in the semi-final and enjoyed a one-two with Smith clocking a new PB of 46.85 ahead of Brier, who clocked 47.54. Both men will line-up for Sunday’s final with fastest qualifier Smith saying: “It felt really good. I had no other interests other than to win there and I’ve come away with the qualifying time which is great and sets me up for tomorrow quite nicely. Joe Brier will be chasing a medal in the 400m. There was also a personal best in the women’s 1500m where Beth Kidger, of Brighton Phoenix, clocked 4:26.62 to finish fourth in her heat and qualify for Sunday’s final. In the field, Welsh indoor shot put champion Patrick Swan narrowly missed out on a medal, finishing fourth with a throw of 16.25m. Cardiff AAC’s Aled Davies landed a season’s best of 15.22m finishing ninth. The women’s 800m saw both Bracknell’s Rachel McClay and Swansea Harrier Laura Maddox run season’s best times in their heats, but neither managed to progress. Cardiff AAC’s Rowan’s Axe also ran a season’s best of 3.49.51 in the 1500m but narrowly missed out on qualification. There will be a number of further opportunities for Welsh glory on day two of the championships with the likes of British Champion race walker Bethan Davies and rising middle-distance star Jake Heyward yet to take to the track. Start lists and time tables for day two can be found on the British Athletics website.